Autonomous driving makes headlines for its potential to move people, but it is in the trucking and commercial vehicles fields that it will roll out first and have the most immediate impact. That was the conclusion of a panel of industry experts at the Autonomous Vehicles Detroit 2018 conference this week. Few consumers will want to pay the extra expense of having self-driving technology in vehicles such as a Ford F-150 pickup truck or Toyota Camry, the panel said. But the cost of assisted driving technology and other autonomous features in trucks and commercial vehicles could have a rapid payback for businesses by slashing fuel and labor expenses and increasing productivity. Advanced safety technologies — the building blocks of autonomous vehicles — are evolving rapidly to enable automated assisted driving and driverless trucks, they said. Consider this number: 43 percent of the cost of freight hauling is the driver, Mooney said. “If I had no drivers on some of those routes, I’d save 50 percent of the costs. It’s economics,” Mooney said. The U.S. will be ground zero in the shift to autonomous trucking. Startups such as Tesla Inc., Nikola Motors Co., Embark and others are pushing truck makers to invest in electrification and automated driving. 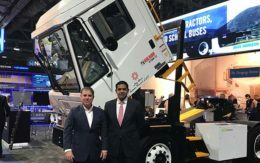 But the trucking industry needs evolution, not revolution, said Mike Roeth, executive director of the non-profit North American Council for Freight Efficiency. Currently available technologies could improve the typical heavy-duty truck’s 6.5 mpg average. Seven truckers achieved 10.1 mpg over 50,000 miles using only off-the-shelf technology in a NACFE-run test last September. Platooning, a technology where two or more trucks are linked digitally to follow closely, reducing drag and increasing fuel efficiency, is an autonomous driving building block that is promising, Roeth said. NACFE testing showed a real-world 4 percent fuel savings from trucks following each other at an interval of about 50 feet. 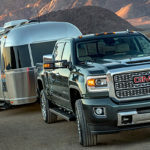 Trailers powered by a small engine and capable of autonomously detaching themselves, parking and docking could be an early application of self-driving technology, Roeth said. Low-speed collisions account for about 60 to 70 percent of body damage to trucks and trailers from drivers backing into docks and parking at truck stops. “There is value every step of the way, and I think there is a business case developing where this will be like a snowball going down the hill,” he said. Trucks at Level 4, an automotive industry designation for highly automated vehicles — Level 5 is fully robotic — could be ready to run on western U.S. freeway corridors, said Jason Roycht, vice president and regional business leader for commercial and off-road vehicles at Robert Bosch North America. A human, for example, would drive the truck to about 20 miles outside of metropolitan Los Angeles. It would then go into self-driving mode for the next 200 miles of highway, reaching a point where cargo would be unloaded or swapped to another truck to continue to its destination. The original truck then would return to its home base. 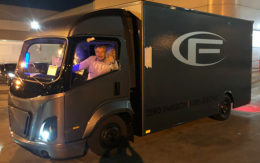 Level 4 autonomy already is being tested by Embark, which hauls refrigerators from El Paso, Texas, to Los Angeles. “The quality of life of a driver is better than driving 400 miles in one direction and missing his kid’s recital,” Roycht said. Bosch, which is partnering with Nikola on fuel cell-powered autonomous heavy-duty trucks, said highway hubs where trailers would be swapped along busy trucking corridors in the southwest, would make ideal locations for electric charging or hydrogen refueling stations. Nikola is raising money for a network of hydrogen stations on freeways. The one thing not being accounted for is the deadliest item on a drivers watch list – 4 wheelers who never pay mind to the road. While these trucks may be able to “talk to each other” autonomy has still not yet reached a point where it can think or react to human stupidity or carelessness. This will either result in a greater loss of human lives or millions in dollars of cargo being scattered on the highway when these trucks roll or wreck. Autonomy never and cannot predict human failure or react to it.